The following is an article from the November 1985 issue of 16 magazine. Kidds for Kids in Africa! Adults And Musicians Aren't The Only Ones Lending A Helping Hand To The Needy In Africa -- Teens Are Doing Their Bit Too! What started out as an idea conceived by the four stars of NBC-TV's Saturday morning show Kidd Video -- (front row, from left) Steve Alterman, Robbie Rist, Gabrielle Bennett-Rozzi and Bryan Scott -- wound up as a major event with over 70 teenage celebrities attending! The name of the project? Kidds for Kids in Africa of course! 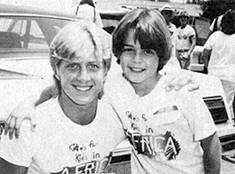 The event, originally scheduled for May 23rd, had to be postponed time and again as more and more teen stars -- like Billy Zabka (left, of The Karate Kid) and Joey Lawrence (Gimme A Break) -- wanted to participate. The Kidds for Kids in Africa relief program involved a lot more than just a gathering of teen celebrities -- the main purpose was to record its first single of the same name which has been described as sounding "more like the Go-Go's"; there will also be a music video made available, plus, the Kidds for Kids logo such as the one on Billy Hufsey's (left, of Fame) and Todd Bridges' (Diff'rent Strokes) shirts will be licensed for use by various manufacturers. Prior to the recording session, which lasted all day long, the participants got a chance to mingle and greet each other during lunch. Here, Alphy Rivas (Jungle Book) gets a great big hug from pretty Kari Michaelsen (Gimme A Break). Once inside the Cherokee Studios (the studio facility was donated by Haim Saban, creator of Kidd Video), everyone settled down for some serious work. Besides (from left) Jason Bateman (It's Your Move), Dana Plato (Diff'rent Strokes) and Meeno Peluce (Detective In The House) -- Meeno's little sister, Soleil Moon Frye (Punky Brewster) and Scott Baio (Charles In Charge) were also there! -- there were approximately 65 other Hollywood teens present, including two African-born celebrity youngsters. Here's a familiar face you haven't seen in a while: Miguel Cancel (left), ex of the Latin group Menudo, who represented the musical end of the business. On the acting side, posing with Miguel is lovely Danielle Brisebois (Archie Bunker's Place) and Pat Petersen (Knots Landing). All proceeds from the single, video and other Kidds for Kids in Africa merchandise will be donated by Kim Fields (Facts Of Life), Meeno and the other 70 participants to UNICEF (United Nations International Children's Emergency Fund), the youth-oriented social assistance branch of the United Nations. It was a long, grueling day for all involved, but the Kidd Video stars, Robbie, Steve, Gabi and Bryan (not pictured), seen here posing with Lauri Hendler (Gimme A Break) were more than satisfied since it was all for a very worthy cause.